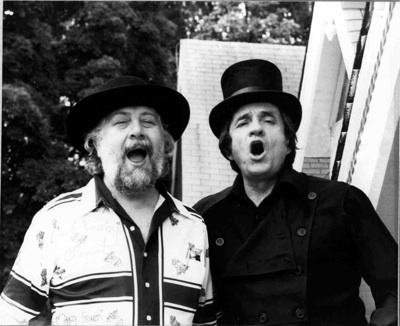 This photo of Jack Clement and Johnny Cash appears in “I Still Miss Someone” next to the poem “My Friend, The Famous Person,” that Clement wrote and read at Johnny’s funeral. In a career that spanned six decades, the legendary singer touched millions of lives worldwide with his powerful, larger-than-life presence and unforgettable songs that mirrored the human condition. He could joke and sing about a boy named Sue and then go straight to a performance with the Boston Pops Orchestra. One and one-half years following his death on Sept. 12, 2003 at age 71, he remains the only entertainer besides Elvis Presley to be enshrined in both the Country Music and Rock and Roll Halls of Fame. In “I Still Miss Someone: Friends and Family Remember Johnny Cash ,” compiled by Johnny’s former publicist and personal aide, Hugh Waddell, more than 40 people from a broad spectrum of Cash’s life share their favorite stories and remembrances of the man who walked the line. 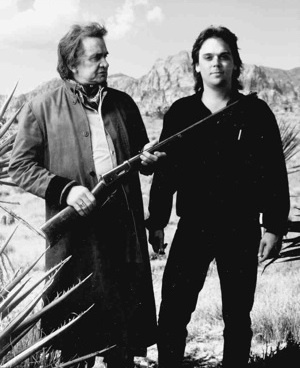 With hundreds of illuminating photographs – many never published before – and a bevy of Johnny’s handwritten notes, backstage passes, and other personal paraphernalia, the book contains chapters written by his children John Carter Cash, Cindy Cash and Tara Cash Schwoebel, grandson Dustin Tittle and siblings Tommy Cash and Joanne Cash Yates. The roster also includes recollections by Cash’s early bandmates W.S. Holland and Bob Wootten, his longtime booking agent Lou Robin, country music icons Johnny Western and “Cowboy” Jack Clement, and the late Merle Kilgore, who passed away in Mexico Feb. 6 while undergoing lung cancer treatment. Kilgore co-wrote Cash’s 1963 hit song “Ring of Fire” with Cash’s then-future wife June Carter and also served as best man at the couple’s wedding. Weekender writer Jody Ewing caught up with TV veteran and author Hugh Waddell — for what he said is his first ever interview given to a newspaper — as well as three of the Man in Black’s closest friends and his No. 1 local fan. “He incited people, and inspired people, to rise to their occasion,” author Hugh Waddell says of Cash. Read Hugh’s story behind the photo. “We receive many gifts during the course of our lives, not just on birthdays or at Christmas, and not all are wrapped,” Hugh Waddell states in the book’s introduction, setting the tone for the recurring theme consistent throughout the chapters – all of which begin with the contributor’s name, their hometown, state and shoe size. Waddell – whose family has been connected with the Cash family for more than 30 years – spent eight years with Johnny as publicist, logistics manager, personal aide and part-time drummer, and said he decided to compile the book after reading only celebrity testimonials after John’s death. “They were marvelous, but I knew there were a lot of people like myself that loved John, that knew John, that had angles and stories to tell that no reporter would know they even existed,” he said. Billy and Ruth Bell Graham – who wrote the tribute’s foreword – are the only well-known celebrities in the book and Waddell wanted them included for several reasons. W.S. Holland first met Johnny Cash in 1955 at Sun Records studio in Memphis while drumming with Carl Perkins during a recording session. The future Man in Black stopped by that day, and he and his bandmates, bass player Marshall Grant and guitarist Luther Perkins, later bonded with Holland. In 1960, W.S. 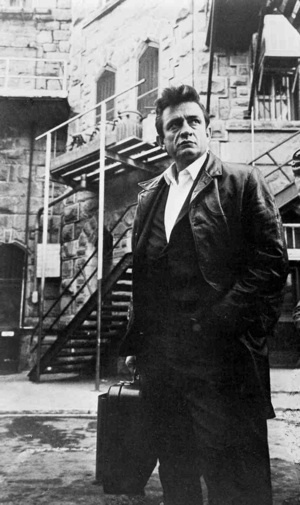 joined Johnny Cash and “The Tennessee Two” became “The Tennessee Three.” Holland, whom Cash dubbed “Father of the Drums,” remained Cash’s drummer until 1997 when Johnny retired due to illness. That amazing time translated into scores of national hits: In 1956, “I Walk the Line” was a top country hit for 44 weeks and sold over a million copies; the 1960 single “Ride This Train” won a gold record, as did the 1963 album “Ring of Fire” and the 1968 LP “Johnny Cash at Folsom Prison.” Cash received 11 Grammy awards over the course of his career. In his chapter, Waddell writes about the late “Mama Cash,” whom he calls a dear friend to his own late grandmother, Marie Comer. When Waddell’s mother passed away in 1987, Johnny and June insisted he join them on the road to soften his grief at home. Shortly after they completed their tour, John asked the outspoken Waddell to work for the couple advancing their concerts. John quickly became a mentor and close friend, leaving Waddell and other employees unencumbered to do what they did best. When Waddell’s father passed away in 1996, John sang at the funeral and once again was there for him. Holland will join up with the legendary stage band’s lead guitarist Bob Wootten for a Johnny Cash band reunion concert in July during “CashBash 2005” – a fan-based, grassroots celebration of the 50th anniversary of Cash’s first Sun Studios recordings in Memphis, Tenn.
“Cowboy” Jack Clement, who first met Johnny Cash in 1956 while working for Sun Records, stayed close friends with Cash throughout his life, playing guitar with him on some sessions just two weeks before Cash died. Before she became his personal hairdresser, Penni Lane says she didn’t really know or understand the magnitude of the man Johnny Cash. She knew two things however: he was a stallion on stage and had a bit of mystery about his presence. During the time she traveled with him from 1969 – 1973 and then worked for him for special events through the early 80s, she began to understand. “I think the mystery was that his presence could create such an awesome feeling that you would feel from other people and from the audience that they had about him when he walked on stage,” Penni said from her home in Nashville. As his hairdresser, Lane also discovered how important Johnny’s appearance was to him, though it had nothing to do with egotistical vanity. The press were not the only ones waiting. Council Bluffs, Iowa native Dennis Devine, Sr. heard Johnny Cash’s “Cry, Cry, Cry” in 1955 and knew he had to meet the singer in person someday. He got his chance in 1960 when Cash performed in Omaha, Neb., at the old Paramount Theatre. When Devine – along with his brother and a friend – discovered the show had been sold out, the ticket office allowed them to stand to the side of the stage for the same $5 price. Between 1960 and 1996, Devine attended more than 125 shows – including three in Council Bluffs where he gave the introduction – and has taken more than 4,000 pictures of Cash and his entourage, many of which appear in Waddell’s book and author Peggy Knight’s books on the Cash and Carter families. Devine proudly wears his title “The World’s #1 Johnny Cash Fan,” and has one of only two fan-written chapters in Waddell’s book. Lane says she owes to Johnny Cash many joys she otherwise never may have known, and misses the fact that his presence is not alive in our world now. “He is a piece of American musical history, and I was making history with this giant of a man,” she says. Cowboy Jack Clement, echoing the thoughts of friends, family and fans alike, says he misses Johnny’s fantastic sense of humor. as well as other online sites and in area bookstores.